Aloha Airport Shuttle has made being picked up at the Honolulu Int'l Airport as easy as 1-2-3! When you make a reservation for an arrival, we get your Airline - Flight Number - Scheduled Arrival Time so we can monitor your updated flight arrival time. 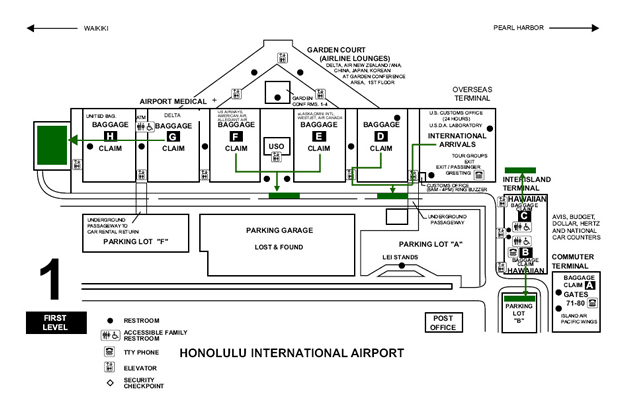 We will have a driver assigned to you and standing by just a few minutes away shortly after you arrive at the Honolulu Int'l Aiport. We will be expecting your call and will give you instructions to the designated pick-up spot. And don't worry, it's not very far at all! Within in 5 minutes we'll have you packed up and on your way to your destination.